Deus Ex GO is Square Enix Montreal’s third installment in their GO series, which reimagines console games as mobile turn-based puzzlers. I reviewed Lara Croft GO (LCG) back when it came out and I loved everything about it. I only really had two issues with it — the lack of an undo button and the long loading times when restarting a level. The developers did speed up the loading times for Deus Ex GO, which I’m grateful for. But they still left out the undo button. I’ll get to that in a bit. First some of the positives. The soundtrack is once again perfectly suited for this type of game. It’s chill, but interesting enough that I left it on all the time, never feeling the urge to mute it. The game also looks great. Maybe not as great as LCG, but the low-poly look is back and the animations bring everything to life. 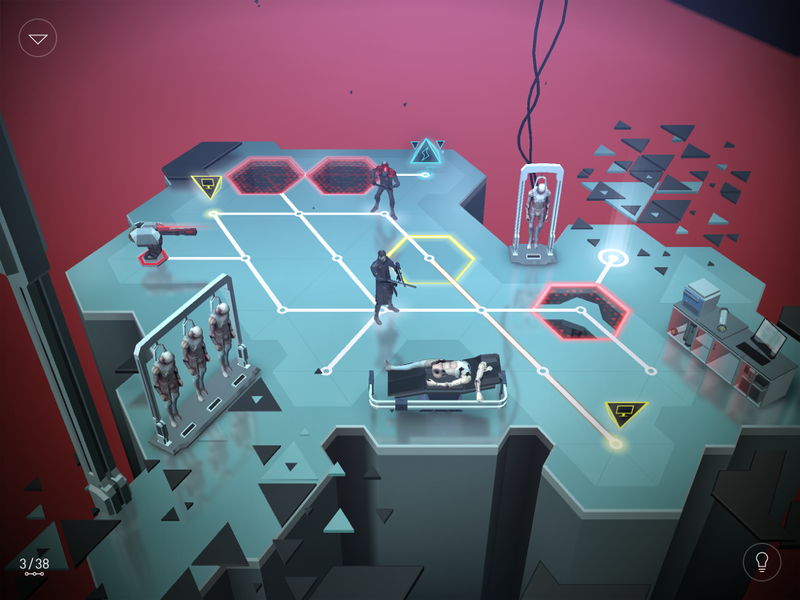 This time around, everything takes place on a single plane, instead of the multi-tier puzzles seen in the previous game. 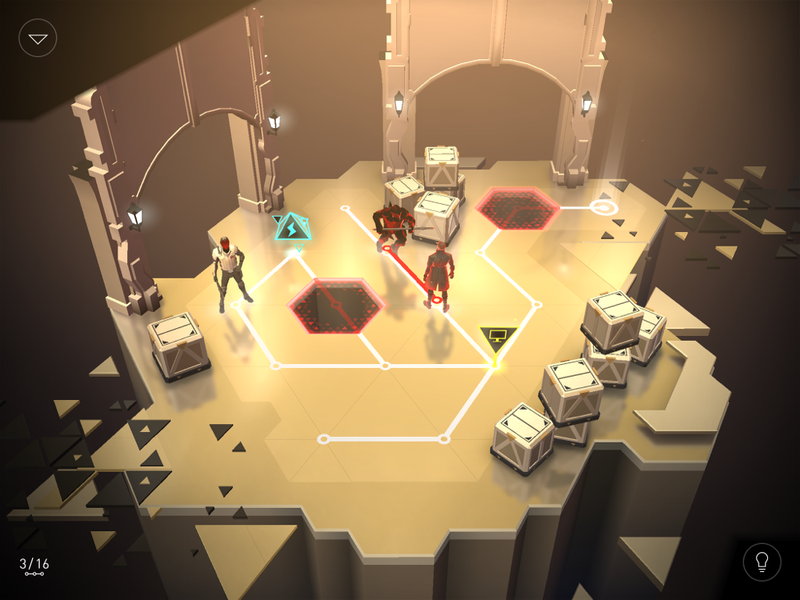 It’s almost a cross between LCG, Hitman GO and Uncharted: Fortune Hunter. Once again, you have nodes and a grid connecting them. You swipe anywhere on the screen to move your character, Adam Jensen, over one node. The goal, as in LCG, is to reach the exit. Only this time, you have an extra objective to work for if you’d like, which is achieving Gold status by completing a level within a set number of moves. You obviously have to avoid getting killed by enemies or obstacles in your way. And sometimes you’ll need to use the enemies to help you, even going out of your way to protect them and keep them alive. To aid you in all this, you’ll pick up these blue objects that have multiple uses. Early on, they only work as a cloaking device, turning you invisible for the next step you take. But later you discover you can use them to hack computer terminals remotely. Hacking is a huge part of the game, as it allows you to draw a line from the computer to take control of enemy turrets or make a floor panel appear where there previously was none. There’s a third use that doesn’t come into play until the last few levels of the game, so I won’t spoil that for you. I will say that I think it would have been a more interesting game if all three uses were available from the beginning. It also would have been less confusing, as in its current state you suddenly have a new skill that you didn’t have before. There’s no real explanation why you now can do something you couldn’t before. It also makes it feel like the earlier half of the game was a bit gimped just to make the difficulty ramp up more slowly. But I’m sure there are many players who will appreciate this progression. Either way, there’s enough variety to make the puzzles really interesting, even if they don’t have quite the same magic as LCG’s. I should also mention that I’m grateful the GO series continues to utilize flawless iCloud saves, which is something most of my favorite games still lack. The game also plays great on both iPhone or iPad, but I prefer to play on my iPad at home for the extra screen real estate. So I’m glad they didn’t make me choose between my two devices. Ok, now back to the undo button. 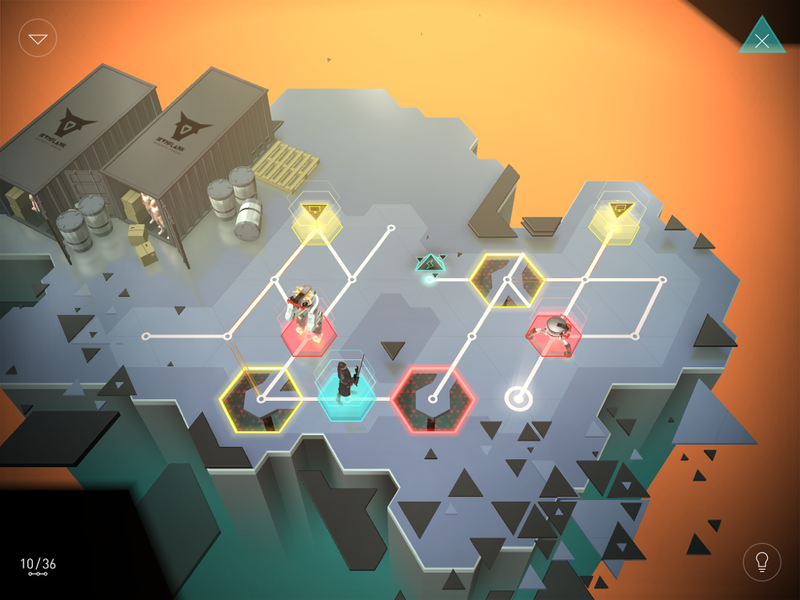 I was more forgiving about it with Lara Croft GO, but since then I’ve played a number of turn-based puzzle games that have them, and I’ve almost come to expect it. The experience is so different with it. One obvious reason for it is that there are a lot of things going on in this game. Even though it’s turn-based, it’s easy to mis-swipe or just swipe when you meant to tap and then swipe. For instance, to hack a terminal, you tap on the computer and then drag your finger to trace lines to the object you want to control. But if you accidentally swipe before tapping, at the very least you’ll lose your chance at Gold status for that extra move and have to start over. It’s also easy to accidentally cancel the hacking you achieved, wasting another move, or worse, wasting your special ability. This was less of an issue with LCG, not least because there was no move counter. Sure, it can make a somewhat easy game too easy. But that’s what’s so frustrating about Deus Ex GO. The mechanics are here to make truly ingenious puzzles. There are a lot of different enemies and mechanics, from turrets to walking mechs to bomb-dropping drones, and of course the cloaking and hacking. I can’t stress this enough — the elements are available to make a really satisfying puzzle game. But, like I said earlier, they left the filler in there to slowly ramp up the difficulty. An undo button might have made easier levels too easy. But the framework should have been designed around the meatier puzzles, especially since a level editor is planned for the future. When things get more intricate and you have levels with 40+ moves in a single puzzle, it gets incredibly tedious to restart over and over from the beginning because you haven’t figured out the last few moves to achieve Gold status yet. Or just simply mis-swiped. An undo button — even a limited one — would have made any mistakes due to the controls a non-issue, since you could just pretend it never happened. You can see in the video below that from the very beginning I was already annoyed by both the lack of an undo button and the fact that the move limit to get Gold status on a level doesn’t show while playing through it your first time. If you want to try and go for gold on your first attempt, you have to keep pausing the game to see how many moves you’ve made. I’m sure they have a reason for it — probably to get people to ignore the numbers the first time playing — but all it does is force those of us who do care about getting gold status to waste more time. And any complaints I have of the game are related to just that — wasting my time. It doesn’t feel like the developers truly value my time. They made a pretty solid puzzle game here, with even greater potential. But the limits they forced on the game amount to little more than time wasters. Take a game like Snakebird, where each and every one of the 50ish puzzles are challenging in all the right ways. An unlimited undo button doesn’t make the game too easy because the puzzles are so ingenious. Deus Ex GO doesn’t quite hit that level of challenge from beginning to end. There is some filler, and entire earlier chapters can be completed in the time it took me to complete one early level of Snakebird. 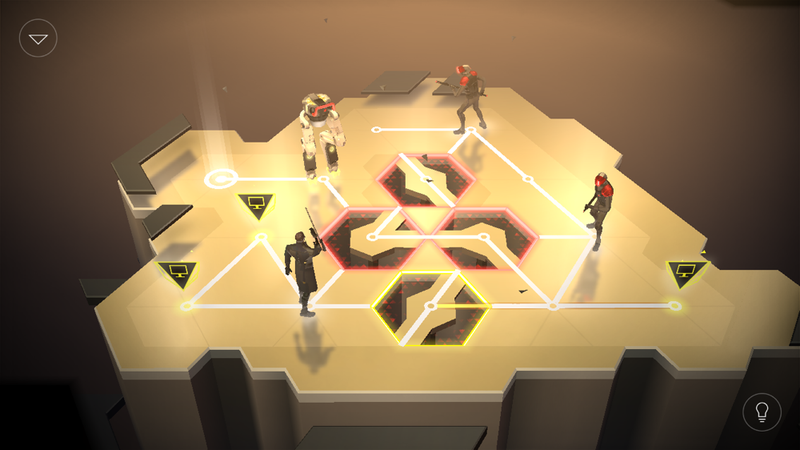 But Deus EX GO does oftentimes feel as complex as Snakebird and is truly satisfying. It’s just that the unfriendly restrictions make solving those tricky puzzles tedious. There’s only so many times you can restart the same level before you consider moving on to a different game. I really wish the developers would take pointers from the absolutely terrific Snakebird on how to respect players’ time and intelligence. Let’s talk a bit about the story. Actually, I can’t really. I ignored most of the story and dialogue. I paid attention at first, but I know nothing about Adam Jensen or the the Deus Ex universe and it was not told in an exciting enough way to get me interested. There were just un-skippable cutscenes that consisted of dialogue from different characters popping up on the screen at the end of important levels and occasionally during them. There’s no voice acting to draw you in, but that might have actually made the inability to skip them even worse. I got so frustrated at seeing the same cutscenes that I stopped caring altogether about what was going on. I should have been allowed to skip them on my second play-through of a level, at the very least. I was mainly here for the puzzles, so being forced to watch the same cutscenes over and over while trying for Gold status really got on my nerves. My other huge complaint is one I don’t think I’ll be able to forgive or move past unless it gets fixed. The game has a little over fifty puzzles as part of the main story, but then there are daily puzzles that unlock every weekday. This seemed like a great way to give the game some longevity. The first week of puzzles have also been pretty darn tricky, more challenging than most of the main campaign. In fact, it seemed like the main campaign was training for these puzzles, which are the real substance. So I was enjoying playing them, but at my own leisure. I completed three of the five of the first week and was about to continue chipping away at the other two when I got home last night. But, to my surprise, the entire first week was replaced by the new week! Last week’s was nowhere to be found. I discovered that I could set my device’s date back a few days to access the old levels again. But this means photos will get dated wrong, among other issues. Additionally, you can’t access the newer levels until you change it back to the correct date. The developers later tweeted out links to each individual puzzle so you can play them, but they still disappear after you leave that specific level. Not a great fix. I don’t like having to jump through hoops to play a game. I want to play games on my own schedule and at my own pace. So at the moment, I’m likely going to just move on now that I finished the main campaign, and only bother with the daily puzzles if they add a way to access all older ones without any weird catch. I don’t want to feel pressured to cheat because I couldn’t solve a puzzle in time. These issues are only made harder to swallow by the inclusion of consumable in-app purchases (IAPs) in the form of hints. 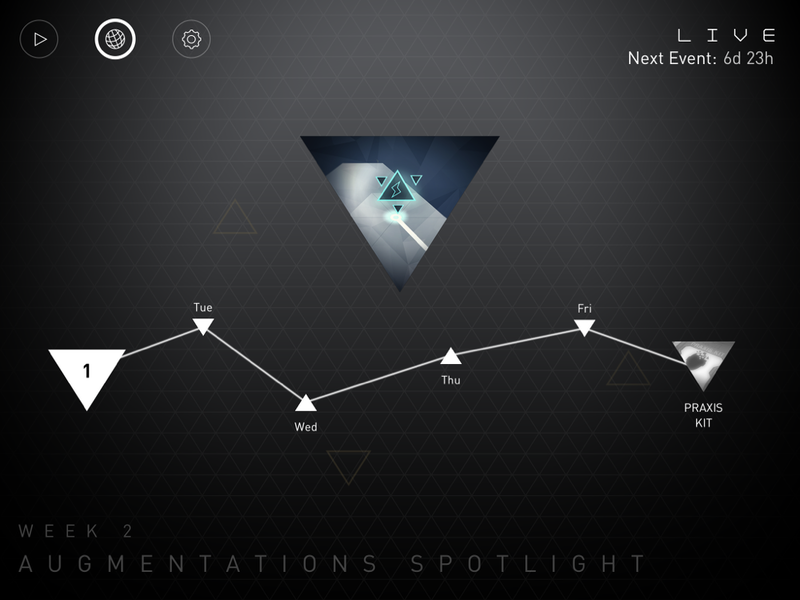 Unlike LCG, which had a one-time purchase for unlimited hints, Deus Ex GO takes the less-friendly route of offering various packages of one-time use hints. Considering the daily puzzles are tricker than the story campaign and they disappear after a few days, I can’t help but wonder if these decisions were made to pressure players to spend money on hints to avoid undue frustration or miss out on puzzles altogether. I personally don’t like using hints, as I find it takes all the fun out of the game. I much rather go at my own pace and find the solutions myself. All that said, there’s terrific puzzle game here. I had plenty of “Eureka!” moments that were truly satisfying. It’s just unfortunate that they decided to put up all these roadblocks in the way of the fun and that I (and others) will likely miss out on the best puzzles because of that. I want to say there’s hope that things might change, but if on their third go (ha!) at this series they’re still pulling tricks like these, I can’t say I have much faith in that. If you want to give the game a try despite its flaws and frustrations, you can download it here. If you need help with the game, try my complete walkthrough guide.